Most infants and toddlers sit with their legs bent in front of their bodies. This position is called ring sitting. They are also very active and move around when playing on the floor. All this action stretches and strengthens and stretches the hip and trunk muscles. Toddlers (as well as infants and older children) with joint hypermobility and low muscle tone often sit in w-sitting. In this position the hips are twisted inwards and the knees are twisted outwards to an extreme degree. Why do some children sit between their legs? Children with cerebral palsy develop increased muscle tone (called spasticity) and tightness in the muscles on the inside of the thighs (hip adductors and internal rotators). This tightness restricts the child's ability to twist the hips outwards and move the thighs apart which makes sitting in ring or cross leg sitting difficult. 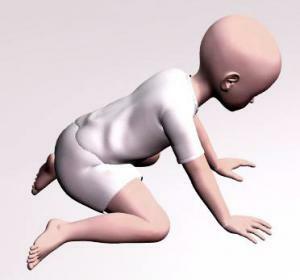 Infants with joint hypermobility often have their legs wide apart in the crawling position and when they want to sit down they move the buttocks straight back between the thighs. This movement requires less effort and control that the twisting action adopted by children who are not hypermobile and have good coordination. 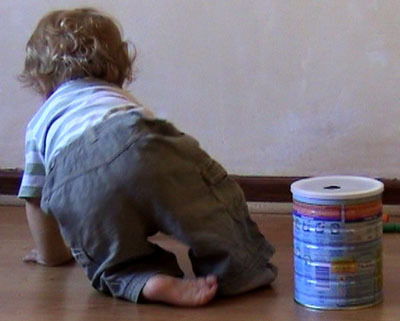 Infants with good coordination and strength are very active when sitting on the floor. They are able to twist their trunks to reach sideways and move forwards over their legs to reach forwards. This requires good strength in the leg and trunk muscles. 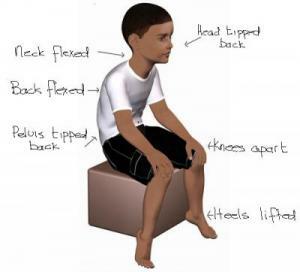 Hypermobile children often sit in W-sitting because the pelvis is relatively fixed and less muscle strength and control is needed to keep the trunk erect. Infants and older children who sit between the legs will often swivel the body around to reach to the side rather than twisting the trunk. 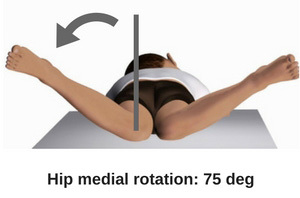 Over time the hips develop a large range of internal rotation. This can be as much as 80-90 degrees of internal rotation, far in excess of the normal range of 45 degrees. External rotation of the hips becomes restricted which in turn makes it less comfortable to sit with the legs bent in front of the body. 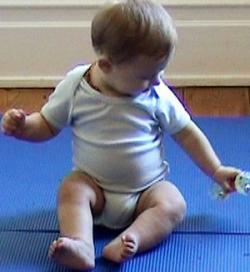 The tightness in the hips can be seen when the child sits on a high surface with the legs dangling. The child sits with the knees far apart and the thigh twisted inwards so that the lower legs do not hang straight down. The the child's ability to sit cross legged is also affected. 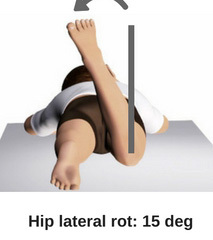 To accommodate the restricted hip movement the child tilts the pelvis backwards and flexes the trunk. How do i know if my child has tight leg muscles? When a child sits with the thighs parallel and the knees bent to 90 degrees the feet should face forwards. 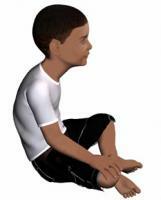 However, when a child sits between the legs, the lower leg twists outwards and becomes stiff in this position. The lower legs develops excessive lateral rotation. This is sometimes referred to as tibial torsion. When the child sits with the thighs parallel and the feet on the floor, the feet are turned outwards. When the child stands with the knee caps facing forwards, the foot is also twisted outwards rather than pointing straight forwards. The outward twisting of the foot relative to the thigh (tibial torsion) leads to excessive strain on the knees and later knee problems. The outwards twisting of the feet also affect running and walking because the child fails to develop good push off at the ankle. Adults with tibial torsion and restricted rotation of the hips tend to suffer from iliotibial band (ITB) syndrome and may develop arthritis of the knees. It is important to understand that W-sitting affects the child's development of hip flexibility and muscle strength which in turn affects movement abilities. Children who sit between their legs almost always have tightness of the muscles that cross over the side of the hips (hip abductor muscles and tensor fascia lata.) This tightness means that the child has difficulty balancing on one leg. A child with good hip muscle strength and balance is able to stand on one leg keeping the trunk upright and the pelvis level. The knee and foot of the standing leg face forwards. 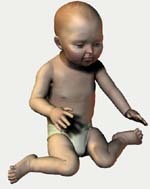 The child uses small sideways movements of the foot to help maintain balance. 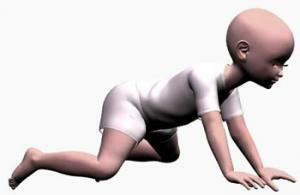 A child with tight hip and weak muscles has difficulty standing on one leg. The trunk tips sideways, the knee of the standing leg turns inwards. Instead of using small foot movement to keep balance, the child may move the arms about. When to child lifts to foot forwards to take a step the hip twists inwards, so that the foot lands on the ground with the toes pointing inwards. This is referred to as an in-toeing gait, and also called walking pigeon toed. Children who sit in W-sitting often have lateral tibial torsion - the lower leg and foot are twisted outwards at the knee. 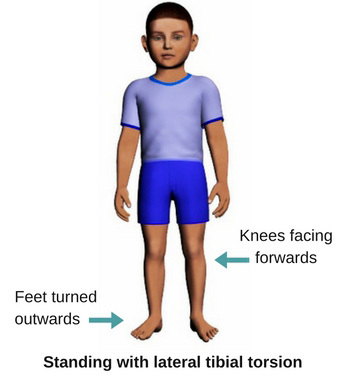 These children also walk with the knees turning inwards, but because of the tibial torsion the feet face forwards or may turn outwards. This type of gait places a lot of strain on the knees and children often develop knee pain, often at night, after a day with lots of walking. When the child walks with the toes turned outwards the normal push-off that should occur with walking is disturbed. 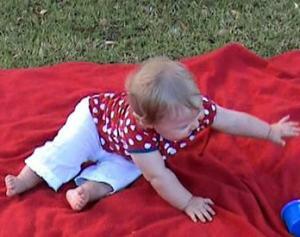 Instead the child rolls forwards over the side of the foot. This makes walking tiring and slow and leads to foot pain. The tibial torsion also increases the flattening of the arches seen in children with joint hypermobility. The tightness in the hips also affects a child's ability to sit erect on a chair with ease and comfort. Children who sit in W-sitting often sit in a slumped position on a chair. The legs are often wide part and the heels lifted up to accommodate the tightness in the leg muscles. Why does my child have difficult sitting up straight? 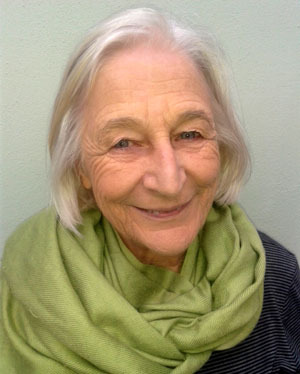 Infants and toddlers who sit with their hips and knees bent in front of their bodies twist and turn their trunks as they reach for toys and move into and out of kneeling and standing. These stretching, twisting and turning movements are important for developing coordination, strength and flexibility of the trunk and legs. Infants and young children who sit in w-sitting do not twist the trunk in the same way to reach for toys, but instead pivot on their knees. 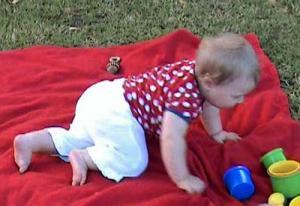 They also move straight forwards from sitting into the crawling position. There are two important things you needs to do to discourage W-sitting. Firstly you need make your infant aware of the difference between W-sitting and sitting with the legs bent in front of the body. 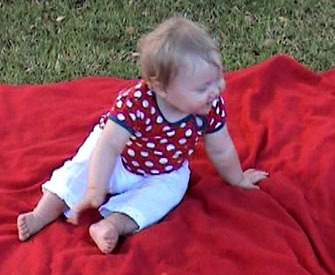 And secondly the infant needs to get used to sitting with the legs bent in front of the body. This requires practice to develop the necessary flexibility and control. When you see your infant sitting between his/her legs, gently move her legs to a better position and say something such as "Feet in front". 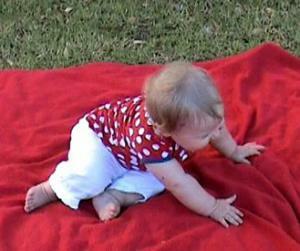 Once the infant gets the idea, you will find that he/she will move the legs when you say "Feet in front". If your child always sits in W-sitting, she will find sitting in ring sitting unfamiliar and even uncomfortable. You will need to spend time playing with her in the new position, with lots of encouragement to get her to reach for toys and move from the new sitting position onto her knees and up into standing. With lots of practice over a period of several weeks the new sitting posture will become comfortable and the child will spontaneously sit with the "feet in front". Encourage lots of twisting and reaching forwards to stretch the back and hip muscles. Children who habitually sit between their legs in w-sitting have tightness in the hips and knees that makes sitting in ring sitting (ie with feet in front of the body and the hips turned outwards) uncomfortable. So the only way to get a child to change the sitting posture is to increase flexibility of the hips and knees so that sitting with the feet in front and sitting cross legged are comfortable. 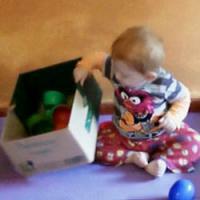 The child also needs to learn to twist the trunk to reach for toys and to move forwards over the feet when reaching forwards.